RK Nagar is an upcoming Tamil film directed by Saravana Rajan and produced by Venkat Prabhu, V Rajalakshmi and Badri Kasturi under Shraddha Entertainment and Black Ticket Company. The movie stars Vaibhav, Sana Althaf, Sampath, Inigo Prabhakaran and others. This is a Premji Amaren musical with cinematography by Venkatesh.S and edited by Praveen.K.L. 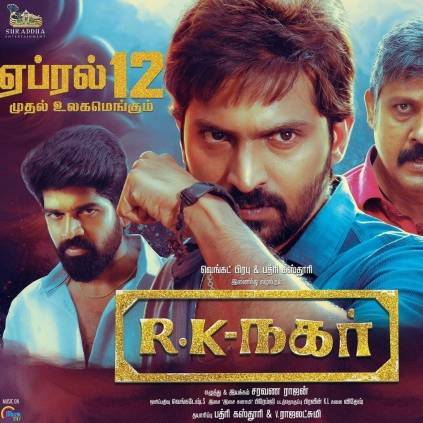 The makers have announced that the movie will hit theatres worldwide on April 12 and they have invited everyone to cast their votes for the RK Nagar movie by watching it in theatres on the said date. Venkat Prabhu is awaiting the release of his Party and is all set to direct Maanadu starring STR, Kalyani Priyadarshan produced by Suresh Kamatchi. People looking for online information on Badri Kasthuri, Inigo Prabhakaran, KL Praveen, Premji amaren, Rk nagar, Sampath Raj, Sana Althaf, Vaibhav, Venkat Prabhu, Venkatesh S will find this news story useful.